Having trouble with your garage door opener? When you come home from a long day with kids and bags of groceries in the car, not being able to get into your garage can be a real pain. You’ve probably pressed your remote button a hundred times at every angle, but still, you’re stuck in the driveway. Here’s one possible solution (assuming you’ve already changed the batteries). Just like clicking the restart button on your computer, sometimes it’s necessary to reprogram your garage door opener remotes. As we all know, technology isn’t flawless. But with a little DIY magic, your inconvenience could be solved faster than the time it takes to write LiftMaster a scathing review. This process will work for both reprogramming existing remotes or setting up new ones. 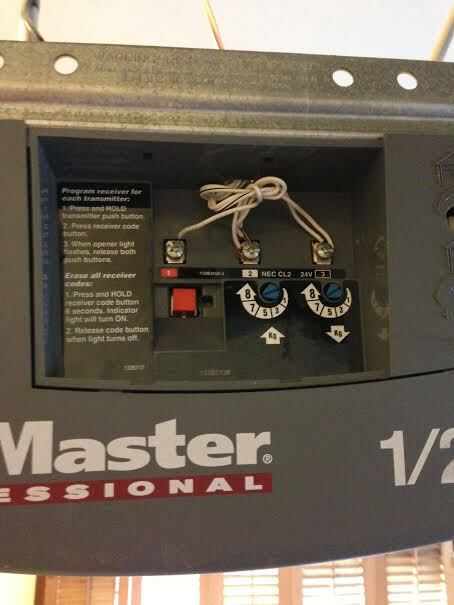 On your opener unit, pull off that small plate to reveal the control panel. We’re working with a popular LiftMaster model, here. On other makes and models you may need to remove the entire cover, but most openers provide easy access to this panel. Just look for a red button. It might say “learn,” or it might say nothing at all, but it should be conspicuous. With your remote handy, press and release that red button. A light will come on for 30 seconds. While it’s illuminated, press and hold the button on your remote until you see the light on the unit blink. If your unit doesn’t have a light, press the red button and then hold down your remote button until you hear two clicks. Essentially, you’re sending a code (ever-changing combinations of codes, actually) from your remote to the unit, allowing it to recognize that remote when you use it in the future. If this doesn’t restore your system to working order, there may be a more complicated issue with your opener unit. Give us a call at (503)-730-0444 and we’ll be happy to troubleshoot and repair the opener for you. Sometimes is also necessary to clear all the existing codes from the unit. Such situations might be when you move into a new home and the previous owner mistakenly took a remote with them. Or, as we’ve mentioned before, a number of things could cause your garage door to open all by itself. To erase all existing codes from the unit’s memory, press and hold the “learn” button until the light comes on and then goes out, which typically takes about five or six seconds. All codes will be cleared. You can now follow the steps described above to program your remotes back into the unit. If your garage door opener doesn’t work and these options don’t solve your problem, don’t hesitate to contact Ponderosa Garage Doors for help. We’ve been in the business a long time and we’ve seen it all. Click here to get a free estimate or coupon for $25 off!